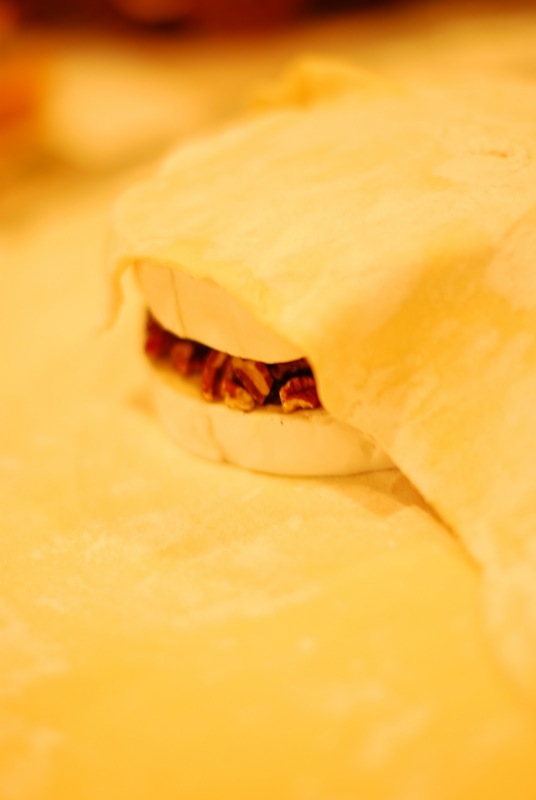 Garden Patch: Baked Brie Stuffed with Craisins and Pecans! Baked Brie Stuffed with Craisins and Pecans! Ok- let's get down to business. You guys have GOT to make this brie appetizer extravaganza for all of your upcoming holiday parties. It is one of my (very few) specialties because it's relatively quick and easy to make, and it is an absolute crowd favorite. As in I'm not sure my family and friends would still come over if I didn't make it. *Preheat oven to 400 degrees. 5. After coating your cutting board with a thin layer of flour, gently roll one pastry sheet with a rolling pin to increase the size of the sheet 1 to 2 inches in each direction. 6. Place the brie in the center of the pastry and pull all four corners of the sheet up and over top of the brie, one corner at a time. This may form a small "bundle" of dough on top. 7. Cover the entire top and sides of the pastry with egg wash (to act as a "glue") and flip the pastry over so that the "bundle" is now on the bottom. The side of the pastry that is now facing upwards is nice and smooth. Cover it with egg wash as well. 8. Using your cookie cutters, cut out shapes from the second, unused pastry sheet. The brie pictured is from Thanksgiving, so I decorated it with pastry leaves to make it festive. 9. Place your shapes all over the brie and cover your design with egg wash again. 10. Place brie on an ungreased cookie sheet (or another oven-safe dish) and bake for 35-40 minutes OR until pastry is puffed and golden brown. 11. Serve with different kinds of delicious crackers. And last, but not least, don't act too cocky when your guests come a running :). this looks SO AMAZING! I cant wait to try it! yum yum yum. that looks delicious. that may be the appetizer i take to a part on friday night! That looks incredible ... I'll have to try it sometime soon. Thanks for sharing ... visiting from Tatertots and Jello. Hi, I'm Jessica! I'm a teacher, a gardener, a travelholic, and a lover of anything adventurous! When I'm not in my classroom teaching 23 awesome 8 year-olds, I'm trying to take on as many adventures as possible! Garden Patch and The Creative Classroom are where I come to tell my stories, share my classroom ideas, and keep track of this awesome journey. So, welcome! I'm really glad you're here. Grown Up Grilled Cheese Party!